Christmas is a magical time in many cities, with colourful lights everywhere. For a photographer, getting to places where the lights are on when the crowds aren’t there either means an early start or staying late. In Sydney this can be especially challenging with some shopping centres now open 24 hours in the last few days before Christmas. 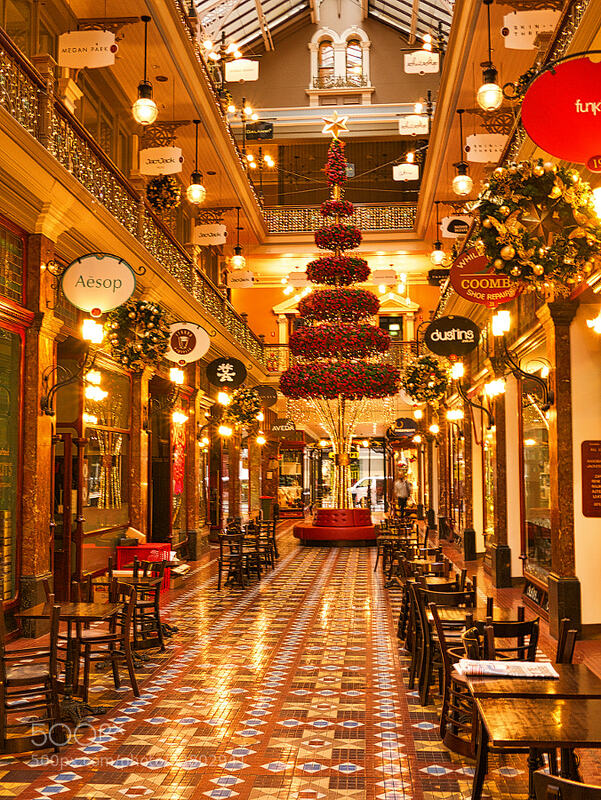 This image was made the day before Christmas Eve, at about 07:15am in Sydney’s ‘The Strand Arcade’. Being early, the centre was already ‘switched on’ but the only people about were office and shop workers heading into work, so I set up my composition and exposure, and waited until I could get the image with nobody in the frame. Of course, this might also make for an interesting image with the crowds present, but I wasn’t brave enough to stand there with a camera on tripod (needed for the slow shutter speed I needed) as the Christmas throngs pushed past to get their last minute gifts. There was something calming about having such a beautiful scene all to myself, even if it was for just a few minutes.